Attendees of the Aero Club Open House got up close looks at the aircraft available to fly. What does it take to learn to fly? The Edwards AFB Aero Club answered that question during their open house Nov. 30. 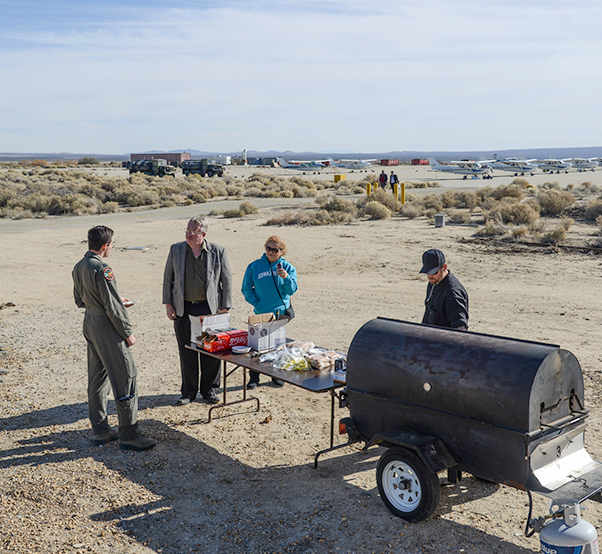 Visitors were invited to a hot dog lunch and entered in a raffle for a free orientation flight with instruction. 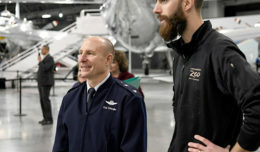 A tour of the facility included the classroom used for instruction and safety meetings, the club’s simulators and a trip outside to see the airplanes. 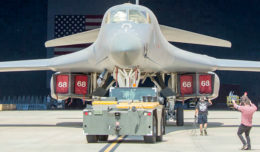 Silke Eyles, Edwards AFB Aero Club manager, was on hand to answer questions such as how many flight hours are required and the associated costs. 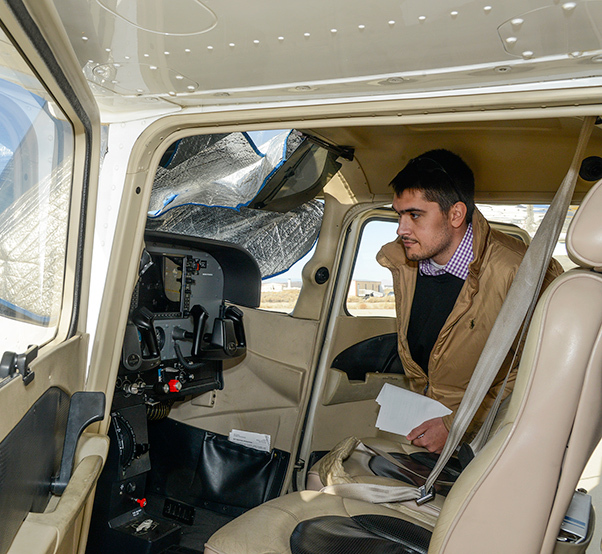 To join the Aero Club, new members pay a one-time initiation fee to enter the Aero Club systems and then a $25 a month fee that covers maintenance and facility up-keep. 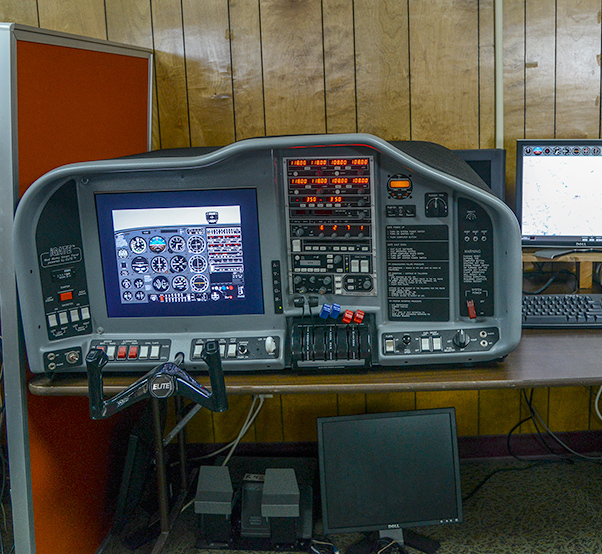 The Edwards Aero Club’s flight simulator. According to Eyles, the monthly fee provides access to “low cost airplanes.” The glass cockpits for instance are roughly $30 less than the average rental costs elsewhere. The Edwards Aero Club offers instruction for both private and commercial licenses on a pay-as-you-go plan. They also provide a list of scholarships that are available to help cover the costs. “This is in my opinion one of the greatest places to learn to fly. I come from the East Coast myself. I flew there 18-and-a-half-years, and when I came to Edwards I said to myself, ‘there can’t be a better place to learn to fly,” said Eyles. The Aero Club offered a free hotdog lunch during their open house Nov. 30. For more information on the Aero Club, call 661-275-AERO/2376, Monday-Friday, 8 a.m.-4 p.m. For afterhours questions call, 661-857-6275 or visit http://edwardsfss.com/wordpress/recreation/aero-club.